Yes, my birthday is indeed on December 9, but no, I swear I had nothing to do with the extravaganza that Argentina’s President Cristina Kirchner and Company staged at the Pink House in Buenos Aires last weekend. Though billed as ‘Democracy Day’, it more resembled a rock concert, and as if to ensure that everyone knew precisely whose party it was, La Cris—still not abandoning her mourning black, but wearing a shimmering body-clinging merry widow gown that managed to belie any hint of sorrow—decided to do her impression of Tina Turner’s ‘hip grandma’ twist-and-shout dance steps (a spectacle that would have been embarrassingly hard enough to watch, even if she hadn’t been the nation’s current leader). Personal criticism aside, however, I hardly doubt the president would have ruled out standing on her head while smoking a cigarette held between the first two toes of her left foot if she’d thought it would better create the illusion of a relaxed, spontaneous outpouring of uncontrollable popular sentiment in favor of her administration, after the party she had planned for two days earlier fizzled, when Justice ruled she wasn’t allowed to dismantle the Clarín multimedia group just quite yet. Oh, and she was so counting on it! For weeks, she and her surrogates had been gloating over the promulgation of the new Media Law that, among other things, would swoop down on December 7 and chop Clarín off at the knees. The pro-K camp was waiting with bated breath for that glorious 7D victory to rub it in the faces of the million-strong anti-K protesters who had their own night in the limelight on November 8. In fact, slaying the Clarín dragon has practically become the leitmotif of the president’s entire adminstration. In the cartoon world where Cristina Kirchner lives, inflation doesn’t exist (her pugnacious Domestic Trade Secretary Guillermo Moreno has long since helped foster that illusion—delusion?—by having his henchmen muscle the national statistics bureau staff into only saying inflation is what he tells them it is), social security pensioners are “vultures” who bellyache despite living in the lap of luxury (with, on average, about USD 384 a month—that is, unless you believe the official dollar rate, another mirror trick that makes 384 look like 512, as long as you don’t actually try to buy that many dollars with the pesos they give you), the country is self-sufficient in petroleum (which is why Argentina spends millions daily to import crude from Cristina’s mentor, Hugo Chávez), there’s plenty of electricity to go around (Clarín just pulls the plug now and then to scare everybody and make the government look bad), the national railroads aren’t in crisis (the disaster in which a commuter train plowed into the Once Station in Buenos Aires was just a quirk of fate), people aren’t starving to death in Chaco and Formosa even if it looks that way (the pro-Clarín media mafia is probably importing those horrid pictures of emaciated people from elsewhere with the aim of fostering the idea that the Kirchner ‘progressive’ model isn’t working), the Central Bank has plenty of reserves (as long as nobody tries to buy more than twenty-five bucks to go on vacation to Disneyland), and the moon is made of green cheese. The only imperfect thing in this perfect cartoon world, then, is the Clarín Group, which used to be a friend, and was okay then, but which is now an enemy and must be destroyed at all costs. And then, in a cruel anti-climax to such a build-up, the Kirchner clan’s 7D didn’t happen. But Cristina wasn’t about to go without her party, so 9D was born. 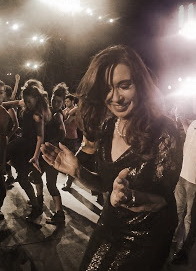 And Cristina got her big-gun rocker friends, Fito Paes and Charly García, to help her celebrate, so as to draw a crowd. But wait! What were they going to celebrate? Clarín, if only for the moment, had won—at least the round if not the match. Why, they’d celebrate democracy, of course! Telling signs of how the government’s supporters feel about such democratic institutions as freedom of expression and division of the three powers of government came earlier in the week, right after the court decision was handed down, when clearly organized rioters smashed windows and hurled red paint at the offices of Clarín Group holdings. And it seemed a bit ironic too, in the midst of all the reveling, for the rock-queen-for-a-night president to be celebrating ‘democracy’ at the same time that she was threatening to impeach the judges who had ignored her desire (order) to make good on her vendetta against Clarín—especially since one of the clearest signs that some vestige of democracy still exists in the country was the independence with which the courts shot down the administration’s plan to make what is basically an anti-trust suit into a popular conquest, and so sidestep a few stages in the due process of law. But then again, maybe that was no more surreal than the 9D crowd’s being led in cheers and hurrahs for the ‘democracy’ of Castro’s Cuba and the ‘democracy’ of Chávez’s Venezuela. Nor was it any stranger than the fact that the vast majority of the members of that “spontaneous gathering” arrived pretty much all together on a veritable fleet of chartered buses—that couldn’t be hidden despite being parked a few blocks away from Government House—and carrying huge banners identifying their political and Kirchnerist labor affiliations. Perhaps it would be a good idea if this were the last ‘spontaneous popular democratic outpouring’ for a while, in what has basically come down to the case of a government that does little more than spend the day plotting how to neutralize its enemies before its enemies neutralize it. Argentina can’t afford any more such extravaganzas, and neither can democracy. I am working my way back through your blog, having just found it yesterday. Recently, I found myself trying to explain "democracy" to a young man in his twenties. I asked him: what do think democracy means?, which he promptly answered by "the rule of the majority". To which I added: "only with the consent of the minority and the limits of that consent are spelled out in the Bill of Rights". I am afraid all I got for my efforts was a label of "reactionary" but it serves to illustrate how hard it is to communicate. Nobody questions the value of democracy, but clearly we mean different things by it. Well, if they labeled you that, Rab, they got it wrong, because that's a phrase spoken like a true liberal. And I couldn't agree more. The idea that once elected a government can do whatever it pleases and answer to no one because it has majority backing provides an open door to the tyranny autocracy or the ruthless rigors of totalitarianism. Unfortunately, "liberal" is used as an insult by people who think this way. You would be surprised to learn how many simply do not know Hitler came to power through the electoral back door. You are absolutely right that accountability is the key.